AAC. Format, of better quality than MP3. One of the first demonstrations of Aaron, here controlling a plotter. Aaron. Proprietary software by Harold Cohen. Absolute (ADI). (Accumulative difference image, ADI) technique uses movement to segment images [Gonzalez]. Also a kind of colorimetric rendering [Photoshop]. - Among the digital artists, the generative ones are in general abstract-minded. See for instance Antoine Schmitt, Hugo Verlinde or Anne-Sarah Le Meur. - Generative aspects: [Berger-Lioret], p. 64. - Non-photo-realistic rendering is also a form of graphical abstraction: it saves of an imagen and stresses, only what is important. - "Mise en abîme" is a the graphic form of regression. See (in French) Echolalie website. 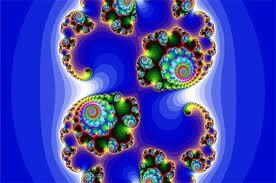 Fractals may be considered a form of "mise en abîme". - It is a graphical form of recursion. Not directly used by artists (as far as we know). Nevertheless, some works, like N+1 of Stéphane Trois Carrés, implement some form of the concept. - Old up, a nonprofit association, works on this question for aged persons. - About accessibility in general, see Wikipedia.
. On the one hand, they augment it dramatically. For instance, the Web and browsers give easy, rapid, and without having to travel, access to considerable assets. They ease also the access to creation, offering for a low price integrated tools for music compositing, infography, etc. . On the other hand, they limit it, since they are complex and require education and talent, from the creators and from the public as well, since they may be physically large and fragile. See curator, handicap. - "Par accessiblité, il faut entendre une modalité d'accès à l'oeuvre qui va au-delà de la simple possibilité technique de la localier et d'en faire l'expérience (en entrant une URL dans un navigateur), et qui peut inclure des éléments rattachés aux notions de documentation (informations organisées sur les oeuvres) et d'exposition (mise en relation, en espace) [Laforet]. - The Old up association works on accessibility for aged persons. 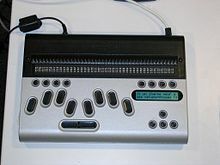 An example of assistance for accessibility: a refreshable Braille display containing an embedded computer, then autonomous (according to Wikipedia). - Accompanist robot Cal Arts Robot Orchestra (5/2011). - Accompanist orchestra: Concerto for violin and Markov model. Communications of the ACM, march 2011. The paper gives the theoretical bases. Video demos are available on http://www.music.informatics.indiana.edu/papers/icml10/. > Synthetic accompanist (1983) Musical software written at Ircam by Barry Vercoe and Larry Beauregard. Accumulative difference image. See Absolute [Gonzalez]. Pious people think that Christ's images have been created without man's hand (acheiropoietic). Today, it is mainly the digital tools that take the hand. Acheiropoiesis, acheiropoiettic. (not man's hand made). - This topic has been studied by Stéphane Trois Carrés, who dedicated to it a communication at à Laval Virtual 2010 (Online). 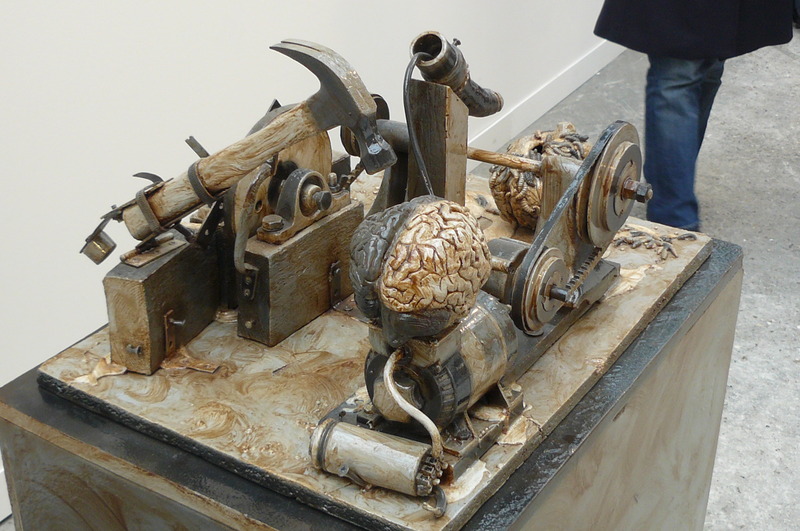 It has deep impacts on digital art: a transfer of the artists creativity to something else (nature, machine, God). 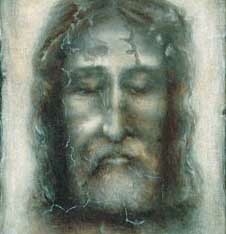 The term refers to miraculously generated works, created without human intervention, notably the shroud of Turin and (at least as a legend), the Christ's face printed on a canvas held to Jesus by Holy Veronic. Trois Carrés shows that, in modern times, machine tends to play a role which was yesterday reserved to God. It is, if you will, the domain of generative art. - Science and technology of sound phenomena. Ircam. - Instrument type: A musical instrument is said "acoustic" if it uses traditional mechanical processes (physical vibrations of a material body) to generate sounds. See instruments. - Yamaha launched the term in 1994. See Hypermonde. 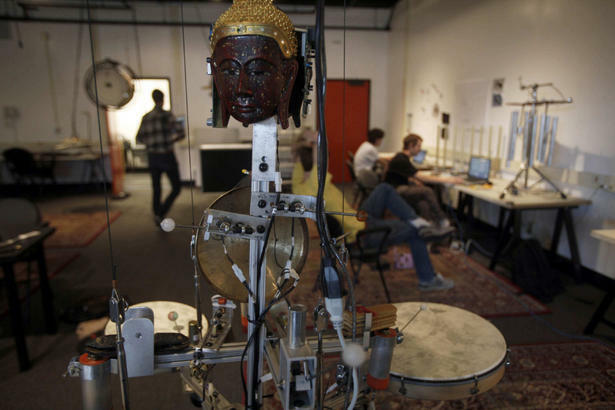 The Cals Robot Orchestra, created by Michael Darling and Ajay Kapur. Acquisition (data) . Use of sensors to get inputs into a processor. < Acquisition de données. Du capteur à l'ordinateur, by Georges Asch et al. Dunod 2e ed. 2003. 528 pages. Very technical. - sound recording for music, etc. Action. The third stage of behavior, after perception and behavior more narrowly defined. Since works of art targets essentially the perception system of humans, the main facet of their action is generally expression. - Action Script, quoted by [Berger-Lioret], pp. 180,187. Active (region or line). See [Brinkmann]. - Ethical and activist considerations of the technological artwork, by David Cecchetto. 11 pages in [Adams]. - An important kind of activist is he hacker. As for art, the most important are the "tactical medias". But non-aggressive forms of digital activism are developing in many non-profit structures, and in the "fablabs". - Person playing a role in a play, or any system (e.g. : L'acteur et le système, by Michel Crozier and E. Friedberg. Seuil 1977). - Type of object used in an animation software. Actuator. Device used by a system to have some effect on the external world. Somehow symmetric to the sensor. Every digital art form uses specific actuators. The most present is the screen for plastic arts and the loudspeaker for music. These devices are in constant progress. They may include powerful digital systems, if not dedicated computers. - See expression. Activism through "tactical media" is an intellectual, or software, political action. < Le beau dans la modélisation des actionneurs. Interview of Emile Louis SH No 35. Aesthetic cooncerns may be important even to designt the basic electrical structure of a motor. - Filters and transformations, see [Gonzalez]. Additive. Color mixing mode. [Brinkmann], [Processing]. Addictive TV. Audio and video authors, as well as DVJ (Disc and video jockey) performances. > Dans l'oeil du pilote. Adjacent Proximity feature between pixels and regions. See [Gonzalez] p. 66-67. Admissibility. A criterion [Gonzalez] p. 377. ADSR. Attack, decay, sustain, release. Typical envelop for a music note. Aerial perspective (from the ABC-dessin website. Affection, affective. See [Breazeal] or, for comic strips [McClough]. See emotion. < Affective Computing, by R. PIcard. MIT Press 2000. Affine (transform). Geometrical transformation, which keeps some properties of forms. For theoretical aspects, see [Agoston], [Zomorodian]. For programming, see [Foley], [Java], [Processing]. - Video on affine transformation. Agent. Digital entity operating inside a system or over a network to do tasks for the user and without its intervention. NPC (Non player characters in games may be sene as a category of agents. Shown on side, a NPC on the distractionmassive.fr site. < Agents conversationnels animés. Greta, une plate-forme d'agent conversationnel expressif. by Martin J.-C. Hermès/Lavoisier 2010. - Multi-agent and art, see Guillaume Hutzler (work and PhD thesis). - Agents and multi-agents. Upgrade set of articles SH No 27 (concepts). - Organisation et applications des SMA. by René Mandiau, Emmanuelle Grislin-Le Strugeon and André Péninou Hermès-Lavoisier 2002. - Principes et architecture des systèmes multi-agents. by J.P. Briot and Yves Demazeau. Hermès 2001. - Les systèmes multi-agents et le temps réel. by A. Attoui. Eyrolles 1997. - Les systèmes multi-agents. Vers une intelligence collective. by Jacques Ferber. Interéditions 1995. < Agents for Educational Games and Simulations by Martin Beer, Cyril Brom, Frank Dignum, Von-Wun Soo Lecture Notes in Computer Science, subseries: Lecture Notes in Artificial Intelligence. Volume 7471. Springer 2011. The "beings" of Alain Lioret may be considered as agents. The multi-processes systems (IBM Watson machine for example) can be considered as similar (or duals) to multi-agent systems. A large part of Artificial Life research is based on entities, or agents. Algorithm for down going, according to the Isocaweb website. AI. Artificial intelligence. See intelligence. Airbrush. Somehow an ancestor of matte painting. - Airbrush illustrations by 12 Japanese illustrators. Sakame Susumu ed. . Tokyo 1981. Very near to matte painting. Algorist. Artist using his/her own algorithms within his/her artistic process. The term has been coined by Jean-Pierre Hébert, and relaunched by the French nonprofit organization Les Algoristes. - Some comments int the PhD thesis of Nick Lambert, and [Berger-Lioret] p. 63. Fun play with caustics at a meeting of the Algorists in Paris. - Algorimthic art: an art where works are created using or according algorithms. This form of art can be practised "by and" (serial music, Roman Opalka or Vera Molnar paintings). Since the advent of computers, this form of art has tended to merge into digital art. - Algorists are artists unsing their own algorithms, which generall they program by themselves. - See a "descente" algorithm (site icosaweb.ac-reunion.fr). < Art, algorithmes, autonomie, programmer l'imprévisible. Communication at Afig 2009. - Art et algorithmes, a tentative cartography of this domain (2007). - Downloadable tutorial Université de Brest . < Introduction à l'algorithmique. Course and exercises, by Thomas Cormen, Charles Leiserson, Ronald Rivest and Clifford Stein. Dunod 2002 (2d edition). < Ideals, varieties and algorithms. An introduction to computational algebraic geometry and commutative, by David Cox, John Little and Donald O'Shea. Springer Verlag, New York 1997. See [Haggard], [Aho], [Berger-Lioret], [Harel], [Cox], [Farin], [Processing], [Faure-Walker] and even [Gombrich]. Aliasing. It is basically an inconvenient, a kind of noise, and is fought out by antialiasing. In some cases, it is used artistically (a kind of blurring, or non-photo-realism). - Steven Worley, in [Ebert] signs an "advanced antiwhaliasing" chapter, aimed mainly at index aliasing. - Channel: See [Brinkmann], [Foley], [Java], [Flash], [Photoshop]. - Alpha trimmed mean filter[Gonzalez]. Alphabet. A finite set of characters. Plastic alphabet, see Herbin , and Rimbaud. in regard to vowels. - See: code, classification, writing. - AR games (Jane McGonigal). And Wikipedia. Example: The Beast, created to promote Stephen Spielberg's A.I. film. Alterity. Some digital artists search for "alterity", i.e. transfer to the machine, or emergence from within the process. It's another way of describing generative art. < L'Internet ambiant. G. Pujolle (ed). Hermès/Lavoisier 2004. SH No 47 (concepts). - A musical style, a kind of immersion. See [Leloup, 2013]. Invented mainly by Brian Eno in the mid 1970's. Analog, analogy 1. Mode of operation, opposed to digital. 2. Explanation of a concept by comparison with another one. - At the human interface level, nowadays, machines are powderful enough to present data under digital or anlog form according to effeiciency and comfort. - Digital/analog opposition may be compared to sampled/procedural opposition. - Analog modes, considered as more natural, will always call for some nostalgy and works to soothe it, for instance Arnaud Rebotini "who presented a live 100% analogic, in order to get back a lost warmth and the musician gesture" (Article by Vincent Brunner, in KR Home-studio - (History). A mode of computation or system where all variables are processed as contiunous electric currents continues. < Analogital exposition in Salt-Lake City, 2013. - Graphic arts : John Whitney used such computers for artistic creation in the 1970's. See also the oscillons of Ben Laposky. Or the works Desmond Paul Henry, using a WWII bomber aiming computer. See the PhD thesis Computer art by Nick Lambert. - Music: the first synthesizers were analog (Martenot, Theremin). 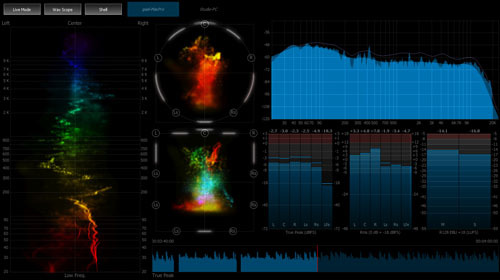 Pure Analyzer, a tool to study signals in real time. Analysis. (See parsing) . Detailed study of an object, a problem, a system. - of images See image. - of language. See language. - of scenes: < Reconnaissance des formes et analyse de scènes, by Murat Kunt and al. Presses polytechniques et universitaires romandes, 2000. - musical AH No 129 (concepts) .See music. - Analytic prefiltering, see [Ebert]. Analyzer. (parser). e.g. syntactic parser (for a programming language, or XML). Example of anamorphosis, presented on the 3DVF website. Anatomy. See [Kemp] and Poser. Anchor. (Internet) A mark in a document, which is a starting or arriving point of an hyperlink. Android. Sometimes used for human shaped robots. Quite a male dominant position, humanoid is more gender respectful. Angle. See [Agoston], [Foley],[Java], [Processing], [Photoshop]. Representations of animals are freqyebt in digital art (mostly animation cinema). 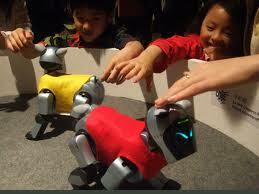 Animal-shaped robots have been used by Aziosmanoff (here) and by France Cadet. - Electronic cat AH No 49. - Aibo by Sony. (no longer manufactured). - Horse simulator: Persival (no longer produced). Animatics. Use of computer for animation. See animation notice. Anisotropic. Anisotropic shader, see [Ebert]. - Automatic image annotation. Wikipedia: Automatic image annotation (also known as automatic image tagging or linguistic indexing) is the process by which a computer system automatically assigns metadata in the form of captioning or keywords to a digital image. 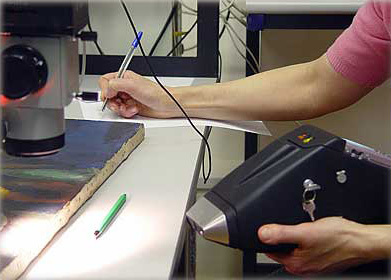 This application of computer vision techniques is used in image retrieval systems to organize and locate images of interest from a - Lignes de temps, a product developed by Iri. - Médiascope, a product developed by Ina. - Fourmis artificielles, Volume 1 Des bases de l’optimisation aux applications industrielles. Volume 2. Nouvelles directions pour une intelligence collective. by Monmarché N., Guinand F. and Siarry P. (editors), Hermès-Lavoisier, 2009..
Anthropomorph, anthropomorphism. Application of human features to natural or artificial objects. 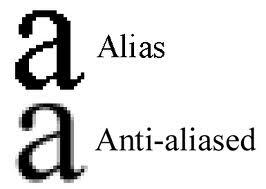 Antialiasing. Suppression or reduction of aliases (for example, due to pixelization). - See [Foley], [Processing], [Photoshop], and a lot in [Ebert]. Antialiasing restores the continuity impression, without augmenting resolution, playing on gray values added to black and white ones. These algorithms are not simple. Arabesque. Arabesque is a minor art, nevertheless quoted by the classical book of Souriau (Correspondance des arts), for systematics reasons. A major part of algoristic art could be so qualified, for instance Fractals. A forerunner of generative graphics. Arc (part of a circle). See [Java], [Processing]. < Archéologie des média. A full issue of MCD, Sept-Oct-Nov 2014 (in French). < Illusions in Motion, Media Archaelogy of the Moving Panorama and Related Spectacles. MIT Press 2013. < What is Media Archaelogy?, by Jussi Parikka. Polity Press 2012. < Archeology der Medien. Zur Tiefenzit tes technischen Hörens und Sehens. by Siegfriend Zielenski. Rowolt Taschenbuch Verlag, 2002. - Notes about experimental archaeology. Architect, architecture. See special notice. Archiving, archive, archivist. See perenniality. < Le club Ina Expet explore le futur des archives. A 3 pages report in Sonovision, sept. 2012. - A substantial set of papers in Sonovision Broadcast, september 2010, by Francis Ploye and Lionel Ollier. - Digitized archives. AH No 65 (pratique). < Arithmétique graphique. Les espaces arithmétiques hypermagiques. 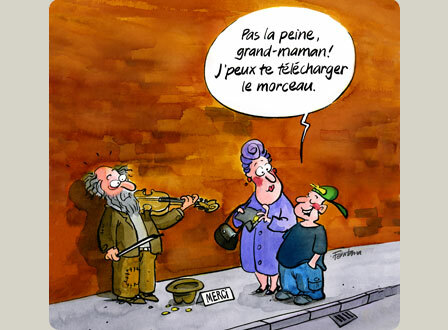 par Gabriel Arnoux. 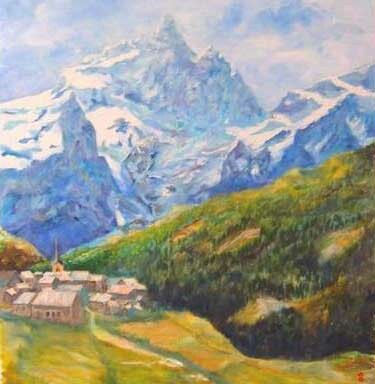 Gauthier-Villars 1894. Mainly the magic squares. 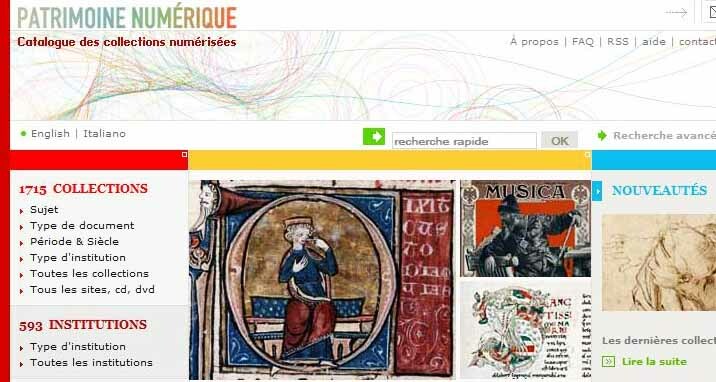 Archiving: a page of the website Digital patrimony of France Culture Ministry. Arranger. Electronic device to "live" play. - See [Harel] [Java] [Processing]. Art, Fine-arts This term is used mainly for plastic arts. <On Art. Artist's Writings in the Changed Notion of Art After 1965. Edited by Gerd de Vries. German-English edition. Verlag M. Dumont Schauberg 1974. -Some comments in Digital Universe. Generally artifacts are unwelcome effects of operations, a sort of noise, somehow. - [Brinkmann], about compositing, indicates for instance the "flare", a local overexposure due to the direct presece of a light source in the camera field, or, in cinema, the wrong effects of a too small fps (frames per second). In general, filters can suppress them. Some artists, like Perconte, use this kind or artefacts as a specifid artistic process. - [Ebert], about textures, indicates many cases. For instance the "seams" between parts of applied textures. The solution comes for instance from rotation matrices. - In music, the Larsen effet and the saturation are typicall unwelcome artifacts. Artificial. See intelligence, life, material, smoke, fog. Artists, at last freed by the computer ? A comic drawing by Faizant, published in 0.1. 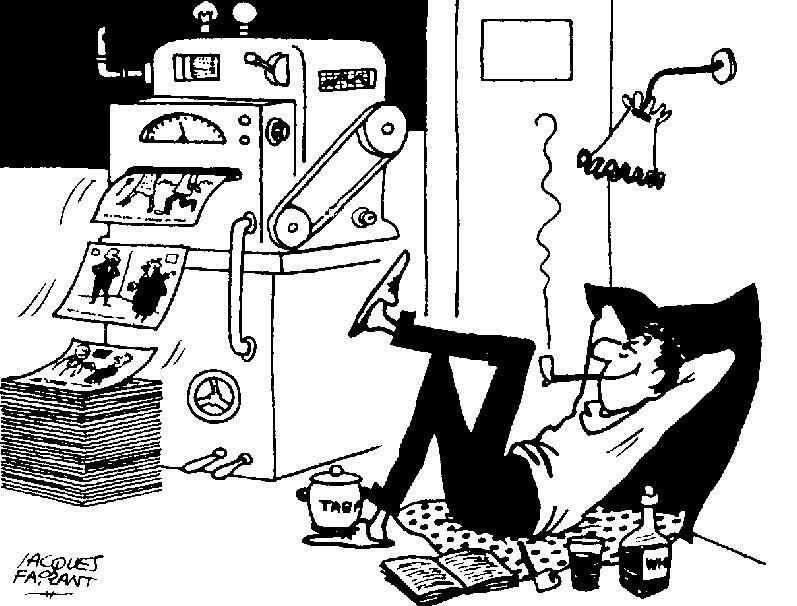 Informatique in 1966. Artist. See our special notice. - See our indexes of the artists quoted in diccan. Aspect ratio (format). See [Brinkmann]. Assembly. An essential facet of digitization, complementary of fragmentation. Asset. Any element created during the production process. - The basic component for cinema editing. A film, in 2010 is done with a million of assets. - A small tour in the Universe with Hubble (PPS). Is is art ? Very beautiful, anyway. - Alain Le Boucher, astronomer and sculptor, makes large works, partly digital, dedicated to this discipline. Atlas. A technique to apply, real time, textures on a 3D volume. [Ebert] p.416 sq. Atmosphere, atmospheric. [Ebert] p. 529 sq. F. K. Musgrave, L. Gritz and S. Worley propose several algorithms. Attributing a work to an artist may call for sophisticated digital techniques. Here on the Konchalovsky foundation). In the future, attribution of digital art works will become an interesting issue. Attention. Attention is an aspect of interaction. Specially the time of attention of a visitor in presence of an artwork (mainly in expositions and museums). See interaction. < Let's pay attention to attention. See our note. < Paying More Attention to Paying Attention. an online paper by Beverley Serell. With a lot of data and even an Excel spreadsheet of figures. Attractor. Attractors and repulsors are interesting functions to animate gazeous objects. - [Ebert] p. 246. [Berger-Lioret] p. 151. - Attribution and authentification of digital works. As ar as we know, the problem did'n arise yet. By constrast, is posed the problem of the original. - Utilisastion de l'informatique pour attribuer les oeuvres. Voir le curieux ouvrage de Bernard Deloche : Une esthétique expérimentale, contribution à une théorie de l'attribution (Editions du Cosmogone 1999). Audio-, audionumeric. See sound, music. < Computer music tutorial by Curtis Roads. < The Audio Programming Book. Edited by Richard Boulanger and Victor Lazzarini. MIT Press 2010. - In gym class AH No 110 (enseignement). - Le document audiovisuel, procédures de description et exploitation, by Peter Stockinger, Hermès Lavoisier 2003. AH No 104 (concepts). "No use, mommy. I'll download the work for you". Authors are threatened by illicit copying. Here, an image of Québec Top website. Hoping they will forgive us. - INA (Institut national de l'audiovisuel). - Communications audiovisuelles by E. Rivier. Springer 2002. - Concevoir et produire un document audiovisuel. by Philippe Bachmann and Marie-Claude Schultz. CFPJ 1991. - L'audiovisuel, faux débats et vrais enjeux. by Philippe Wade. Fayard 1983. - Mémoires de l'ombre et du son. by Jacques Perriault. An archaeology of audiovisual. Flammarion 1981. - Augmented reality. It is the combination of direct look to the real world and presentation of data or other images, typically through a headset, goggles, or today just special glasses. See Wikipedia. A typical application are the locative media. < Mixed Reality. Merging Real and Virtual Worlds. by Yuichi Ohta and Hideyuki Tamura (eds.) : Springer 1999. - Augmented man . SH No 39 (first question of the interview). - Use of noise. A note from University at Albany. Author. See artist and strategies in transmedia. - Berys Gaut in A philosophy of cinematic art (Cambridge university press, 2010) writes 19 pages the authorship issue for digital and interactive works. - L'auteur au coeur du transmédia. An article of two pages, signed by François Chevallier, in Sonovision Broadcast April 2012. "The concept of author is a permanent difficulty in creation. It becomes really a headache with cross-media". - Even the authors, as transcendent as they can be, draped in their sovereign humanity and their uninimtable genius, are more and more known through their digital avatars, from their mail address to their web pages (social networks, personal and institutional pages, collection of texts, images and videos provided by the grand indormation distributors). For a large part, an artistic career develops itself today through this digital environment. - "Nothing penetrates with so much difficulty in the wordly spirit, even in the critics mind, that this incompetency of the authors about their works" (Paul Valéry, Introduction à la méthode de Léonard de Vinci). Besides, to build his career, authors are obliged to have a specific style, and a peculiar nature for tehir projects. In some cases, they to go to write them. And sometimes, like Harold Cohen, they are neally equivalent to their programes (Aaron for Harold Cohen and, at a much more modest level, Roxame for us). I the artists are deeply engaged in this algoristic track, where the computer is much more than a tool, the "who is the author" issue cannot be dodged... nor finally concluded. Cohen says that pleasantly in his 1979 paper What is an image? Remains the collective author issue, or at least the cooperation of several authors. Here, digital art widens to the extreme the range of possible solutions. On the one hand, it makes easier than ever the work of solitary authors. Be they poets, painters or musicians, artists equipped with a computer sufficiently powerful and Internet connecte can, without aid, run the total artistic process, from the original concept to its communication and distribution on the web. On the other and, HR and workflow management tools help to lead and coordinate the works of hundreds of technicians and artists into the creation of grand works, specially for the mainstream cinema, the games and the worldwide events (Olympic games, typically). Automatic, automaton, automation. . See special notice. < Art, algorithmes, autonomie, programmer l'imprévisible. Communication à l'Afig 2009. < De l'interactivité à l'autonomie comportementale d'une création. by Michel Bret. Brouillard Précis, Marseille 2001. < Les systèmes autonomes. Relation aléatoire et sciences de l'esprit. par Jacques Lorigny. Dunod/Afcet Systèmes, 1994. Autosimilarity is an image processing technique. It is also a basis of fractals. Here, an image from the L'Internaute website. A/V Generation . According to Orange collective, a new generation of audio/video artists (2011). Examples: Ryoichi Kurokawa, David Letellier, Herman Kolgen. Avatar. Instance of realization or replacement. On its origins, the term comes from Oriental religions, where avatars are apparences donned by come gods to show themselves to human beings. They have not the connotation, frenquent in Occident, of difficult issues. < Avatars, personnages et acteurs virtuels, ed. by René Bourassa and Louise Poissant. Presses de l'Université du Québec, 2013. See its presenation. < Avatars 3D réalistes et applications génétiques, byRegina Radlova. Online c ommunication (at Paris ACM Siggraph). < Le corps et l'avatar, a series of articles in Archée magazine. < Avatar. An important film by Pixar, and a majo work in 3D animation. The work has been criticized for its scenario, rather commonplace. But a lot of panoramas and medium or close shotse film est critiqué pour la banalité de son scénario. Mais un grand nombre panoramas et de plans moyens ou rapproché are, we thinkn really exceptional. 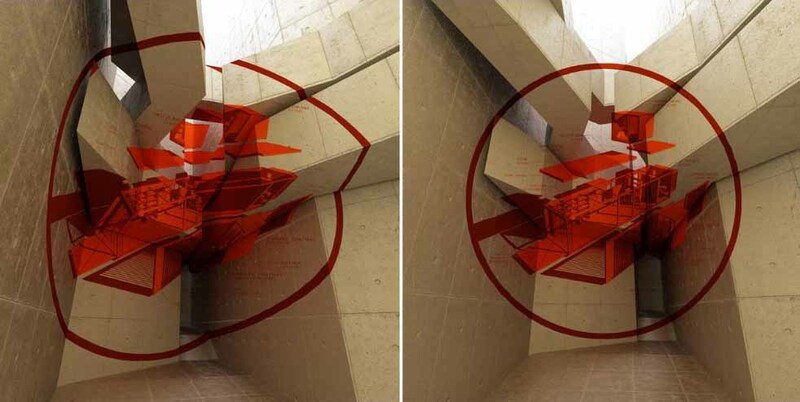 - Adaptive, space, truncated adaptive [Cocquerez].